On December 10, 2017 we celebrate our 17th anniversary of the ride. The terrible need to provide Christmas to our veterans in the hospital and at the homeless shelters continues to grow each year. We are committed to providing Christmas to these humble deserving people. It is only with the help of the community, the motorcycle riders in our state of South Carolina and the local businesses that we are able to deliver Christmas to them. For most of the veterans at Dorn VA Hospital they have no family, no friends and they get no Christmas. This is the only Christmas they will get, which is why we say IF WE DON”T BRING IT , THEY DON”T GET CHRISTMAS. A simple but very plain truth. I recently met a lady who was a recipient of our event last year at Dorn VA Hospital. She was in the hospital, down on her luck and she told me how very special she felt when she saw the bikes arrive, it made her feel like someone cared about her. She said she got to go downstairs and meet the riders, had some Christmas cookies with them and really enjoyed the day, it gave her hope that someone cared about her and other Veterans. Then she got very emotional and said that she got a Christmas bag a few days later with clothes and other things of the season. That was the first Christmas present she had gotten in years, and words could not explain what that meant to her. She finished her story and said that she had turned her life around and was doing much better and this year would be a volunteer to help serve and thank the riders who bring Christmas to Dorn VA Hospital. In closing she said please continue this event it means the world to our Veterans there. So you see one person, one card, one gift can make a difference in the life of a veteran at Christmas time, especially the ones who have no family and friends. We understand our economy is not the best but you can make a difference and everything you give, 100 percent goes to our Veterans. So please take the time to help with this very worthy cause. We can never repay their sacrifice that they gave for our country but we can demonstrate that we care about them. Please imagine being alone with no family and know hope during the holiday season many go all year without a visitor or call, we have the power to change that this Christmas. If you want to help, you can. Go to the web site www.vetsride.org and donate, you don’t have to ride a bike to participate. 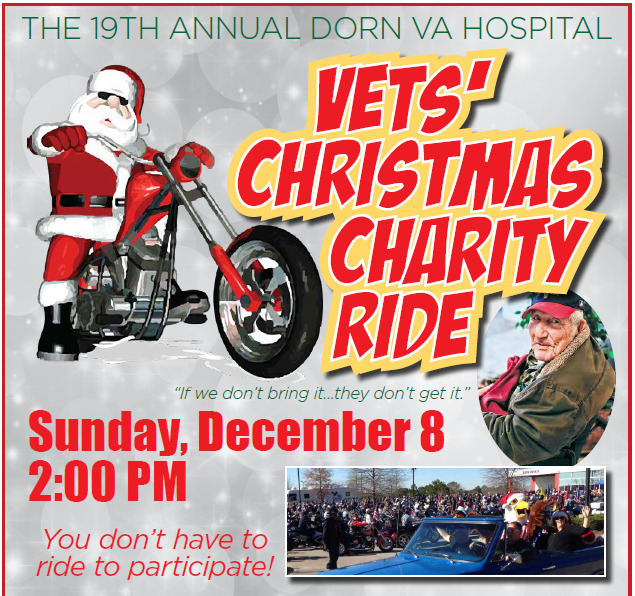 Spread the word about this event and participate in this event by either riding to Dorn VA with us to deliver Christmas or meet us at Dorn VA on the day of the event and bring your gift for a veteran. The ride leaves Carolina Honda at 2PM sharp and arrives at Dorn at 2:45 and we make it a very special time for everyone. I can promise you one thing - if you come YOU WILL NEVER FORGET THE EXPERIENCE. Your business can collect gifts we will even come pick them up, your business, your church, your kids school can all help if nothing more than a Christmas Card YOU CAN MAKE a DIFFERENCE IF YOU WILL. You can provide snacks, baked gods, cookies just call and we will tell you what we need and how you can help. Please call 803-252-3381 or email jwertman@carolinahonda.com There is no way to fully thank all of you who have participated these past 14 years and have made this ride a big success. 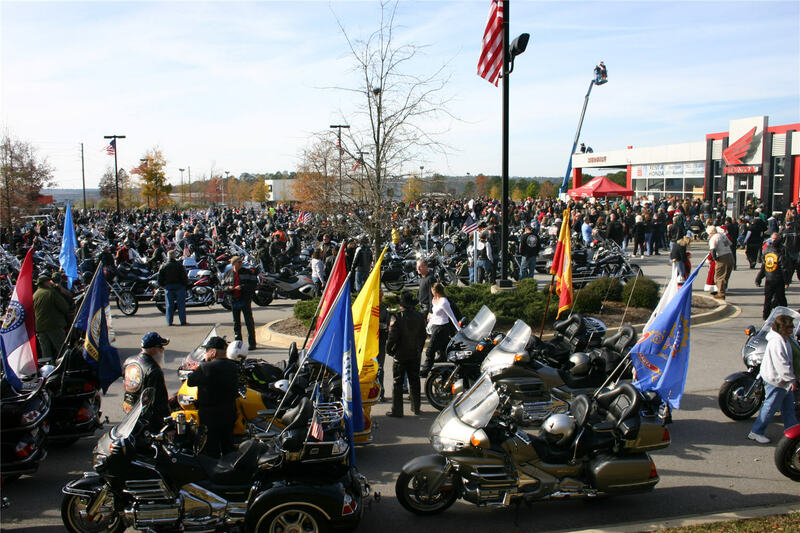 Rain or shine, sleet, snow, cold or warm we ride to take Christmas to Dorn VA hospital Share the experience this year with someone new, bring your kids, your family or give a gift in honor of someone who served in your family but please DO NOT FORGET THESE VETERANS IN DORN VA HOSPITAL. Thank you and God Bless : words will never express my thanks for all that each of you do for our Veterans. I had the privilege of serving in the Army for 30 years and I have never saw anything that tugs on your heart more than this event. YOU CAN MAKE A DIFFERENCE PLEASE DO.